After a close encounter with sun on Thursday, the comet seemed to have been destroyed, but new images suggest that the comet may have survived. STOCKHOLM — Scientists were studying spacecraft images Friday to find out whether a small part of Comet ISON survived its close encounter with the sun. The comet at first seemed to have fallen apart as it approached the sun’s sizzling surface, but new images showed a streak of light moving away from the sun that some said could indicate it wasn’t game over just yet. “It certainly appears as if there is an object there that is emitting material,” said Alan Fitzsimmons, an astronomer at Queens University in Belfast, Northern Ireland. Comet ISON, essentially a dirty snowball from the fringes of the solar system, was first spotted by a Russian telescope in September last year. Some sky gazers speculated early on that it might become the comet of the century because of its brightness, although expectations dimmed over time. 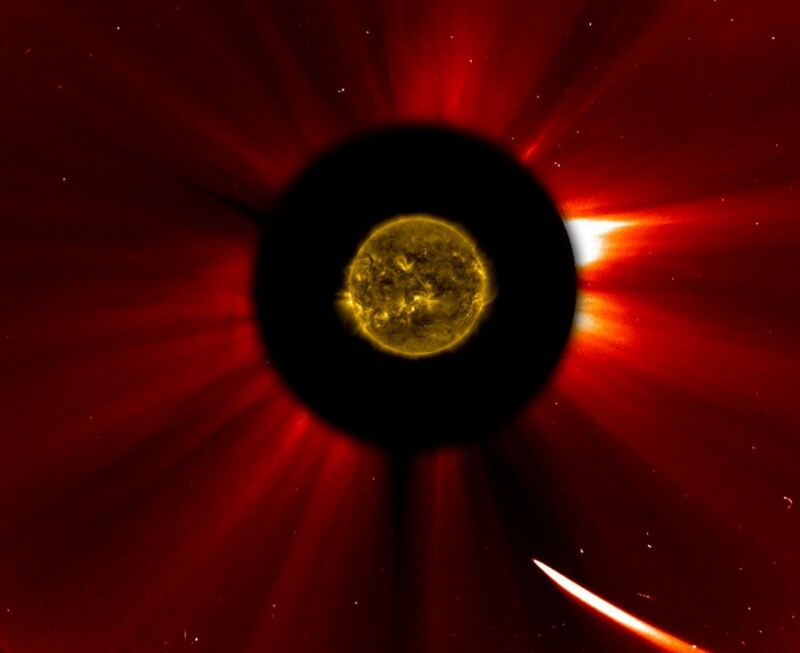 Images from other spacecraft showed a light streak continuing past the sun, but Young said that was most likely a trail of dust continuing in the comet’s trajectory. However, instead of fading, that trail appeared to get brighter Friday, suggesting that “at least some small fraction of ISON has remained in one piece,” U.S. Navy solar researcher Karl Battams wrote on his blog. He cautioned that even if there is a solid nucleus, it may not survive for long. ISON’s mysterious dance with the sun left astronomers puzzled and excited at the same time.